It’s been a hot topic on the professional longarm forums lately: what do we use to mark quilts? Blue pens that are water soluble? Purple pens that disappear in air? Washable pencils? On a whim, I decided to try the new “ultra clean” Crayola Washable markers, and to run a little experiment. My hypothesis: Crayola markers will come out of everything. cold water for soaking, with and without soap. Just getting started with the prewashed Kona white. 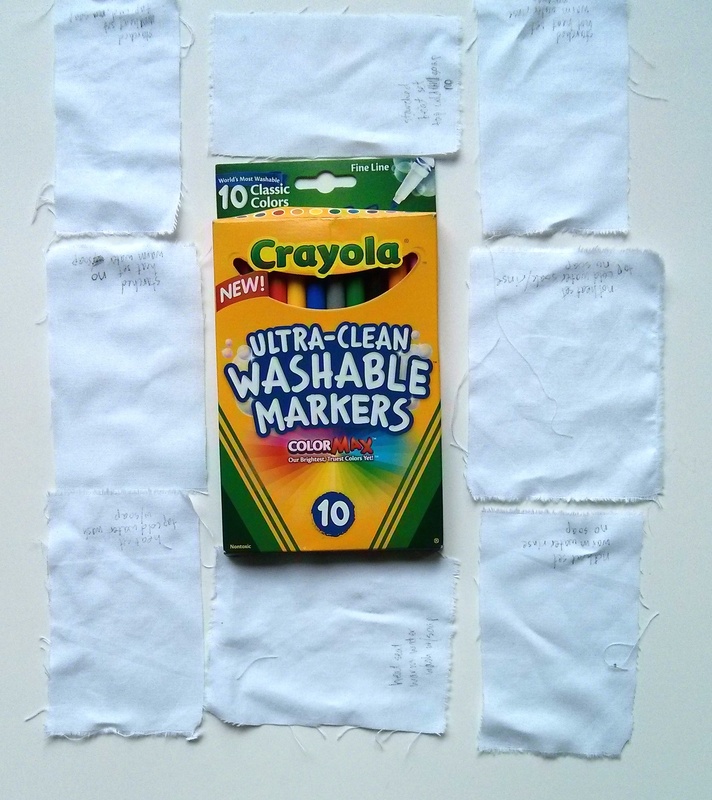 I tried to think of the most common ways we use marking tools, and the most common ways we washed. I made 8 samples of these on the white fabric, and then tossed them in to the water, and walked away (actually, we went blueberry picking, so I was gone for an hour or two). Not bad, huh? Winner winner chicken dinner! These were ironed after washing, to dry them out and make them lay flat. No marks came back. Then I tried them on fabric straight off the bolt, and instead of making light and dark marks, I scribbled the hell out of that fabric. I still heat set. And this time, I just used cold tap water, without soap. Noooooooooo! Not what I was expecting, honestly. I ironed all of these, to make them lay flat. My excitement and hopes were dashed. The unwashed fabrics held on to their markings! And not only that, it looked like the ink that had come out in the water had redistributed itself all over. do note, though, that the ink had no negative effects on the dark fabrics. Ink free! well, except for the Pigma pen ink. 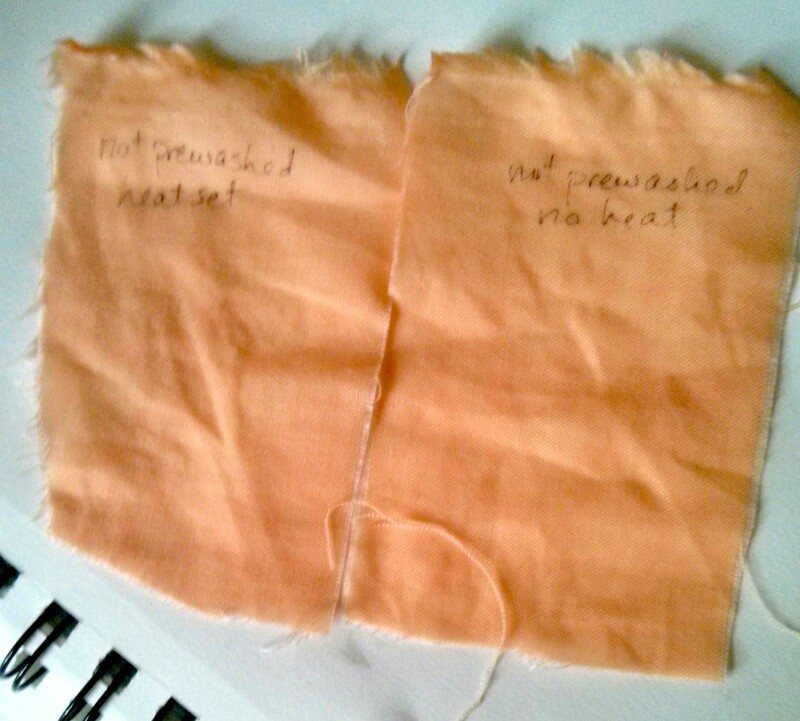 And yes, these were ironed after the initial soak, but not ironed after washing with soap. While I wold not use this on a customer quilt, I would totally use these Crayola markers on my own; I always prewash my own personal-use fabrics, and I always wash my personal quilts after they’re done. They’re cheap, every color I tried (all ten of them int he box) comes out, and they are impervious to heat setting. What happens with more luxury-type fabrics like silks or Radiance, or wool? What happens after sitting in the sun for a while? Let me know if you try it out, I’d love to know your results! More information is always good. Happy quilting, y’all. Hope this helps! I quilt with a longarm machine. The question I would have is if you used these on a quilt that was already stretched on the frame. Would the ink go through to the batting and then perhaps have a problem with not coming out. 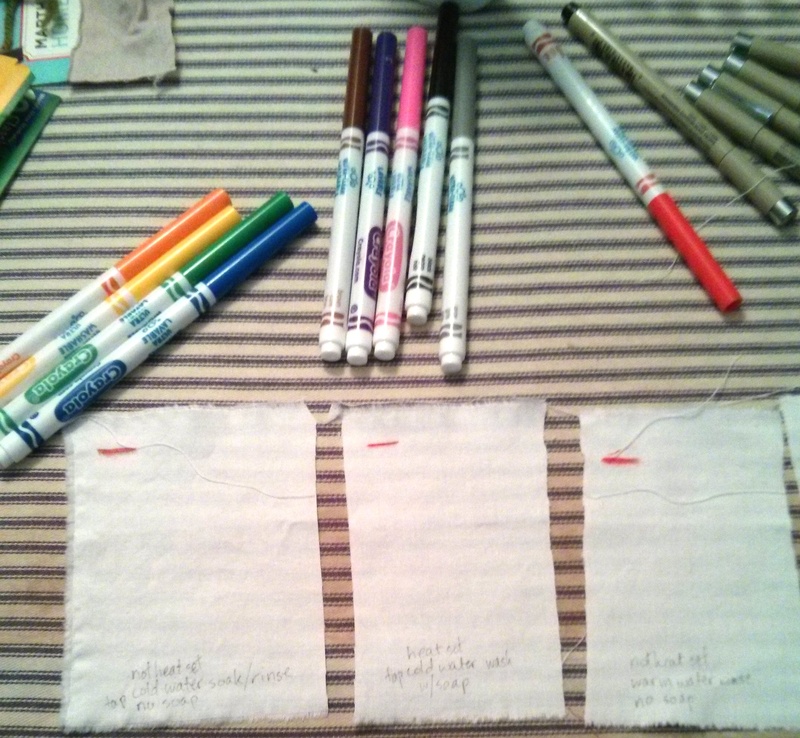 But it does look like these would be good for any marking done before the quilt is layered. Thanks for doing the experiment. I have used them on quilts after putting them kn my long arm. I have had no problems. I have used washable markers on my quilts as well, mine happened to be Rosemark brand. They have come out well with no problem. When I have marked my quilts they are already layered and I see no problem with color going into the batting. I don’t have a concern using them anymore. Thank you so much for a great experiment! Love the attention to detail and the results. I’ve been using my Frixion pens to great advantage. It’s nice to see another option. This is great information! Now I just have to see if I can get them in Switzerland without paying a fortune for them. 🙂 Thanks for sharing! Hi Elita! I bet most washable markers would work. If you try some out, let us know what you used? Great test and it is great to know the results. I’ve gotten this marker out of the kids clothes before but never thought of using them to mark as needed in my studio. Thanks bunches. Have used washable Crayola on my own quilts for a number of years, and do mark while quilt is on the longarm. The only issue that I’ve found is that a small amount of colour (looks like coloured dust) occasionally settles in the quilting lines. A second wash got it out. Using a prewash spray of Shout or Resolve eliminates that. Thanks, Gail! I was wondering about what happened when actual stitching occurred. Thanks so much for the documented “experiment”!!! I have had a set of washable Crayolas for a while now and haven’t worked up the courage to use them………that has certainly changed. I, too, will only use them on my quilts not the clients’ (as I wash all my quilts when finished). Yeah, while I am totally comfortable with them, and feel there wouldn’t be any problem, not everyone washes their quilts! This would be great for other applications, too, especially marking for cutting, etc. So right! “Thinking outside the box(sic)”, one could come up with a multitude of other (than intended) uses. Something to work on over the upcoming snowy months…. Thank you for doing the experiments. Thanks for all this information and detailed foto’s. I’m very happy with it!! Any information on the Crayola washable markers archival (or not) qualities? I haven’t seen anything on that. Since I usually wash my quilts after construction with a product that removes all additives, I don’t usually worry about it. Sorry for the delay! we’ve been on vacation. what is your preferred quilt “soap”? I use spray bond to sandwich my quilts. Do you? 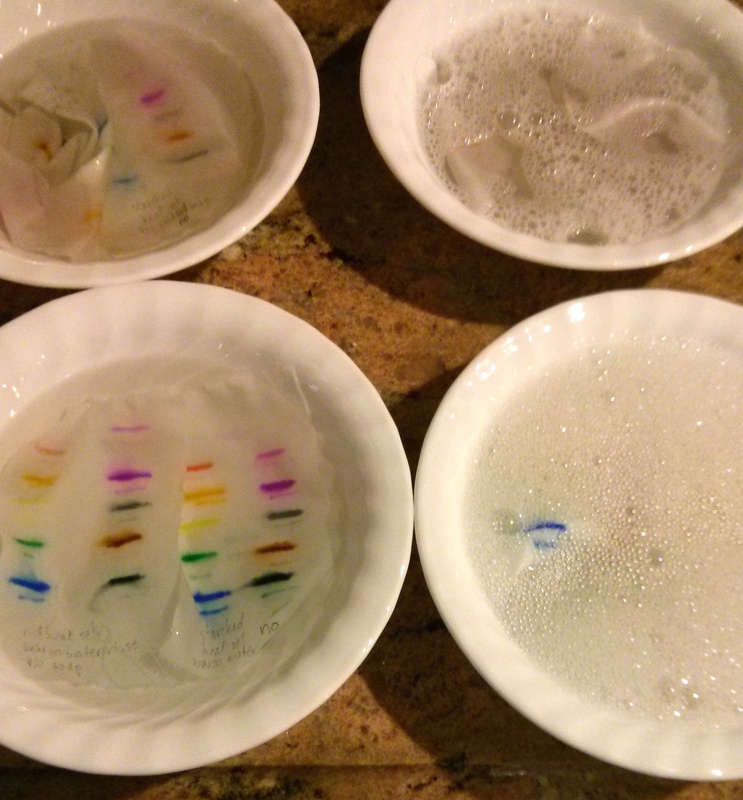 How do you know that Charlie’s soap washes out ALL additives? Though I’m not a huge fan of using pins, I worry about what’s left behind from the spray bond (505 for example). Hi Linda! They’ve posted a series of studies from independent labs on their website. I have gone by those. I have used the crayola washable markers on my quilts with great success of markings coming out with all colors except yellow. I won’t use the yellow now. You do have to use soap , but I just use dish soap and wash in my kitchen sink. I usually try to get these done quickly do the markings aren’t older than a week. I also use paper stencils. Has anyone used this product to mark your quilts that are going to be hand quilted? I’m a slow quilter so it may take several months or longer before the quilt is ready for washing. Has anyone left the marking in this long and if so what were the final verdict? OK< I will be writing a follow-up post on this! I attempted just that with the black marker, scribbling the heck out of some fabric and then letting it sit. Long story short, test it yourself with different colors. the black didn't come out after 2 months. I used it to mark a baby quilt, then life got in the way and it sat for 9 months before I quilted it. I had no problems with it washing out. I was using darker colors. I did it on a second one and there was a slight residue after the first wash. I have not yet rewashed it. I think it was the colors I used on that one–yellow is tougher as was either purple or red (can’t remember which) I have had no trouble if I quilt and wash within six weeks or so. BTW mine was the Washable, not the ultra washables. Great information! 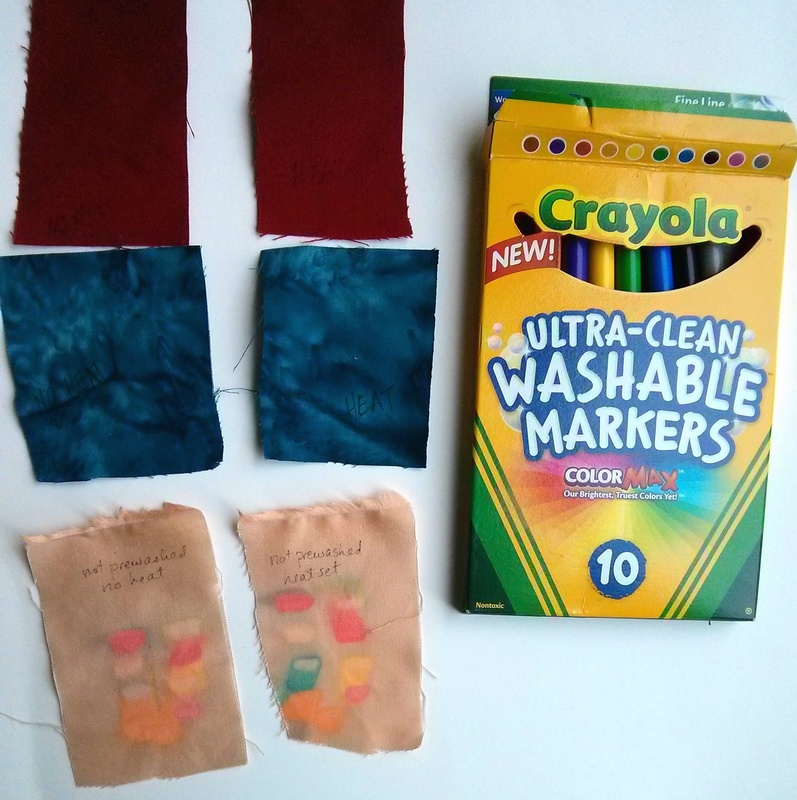 I have used washable markers for several years and absolutely love them. As was shared, once in a while I get a stubborn one that leaves residual marks in the stitch line but with additional washing, it comes out. I do replace my every year even if they are still usable because I worry the dyes might degrade over time and become unstable. That’s a great point! It also reminds me I need to share my stain remover, ha! I used a black marker, and I mean I SCRIBBLED HARD and left it for months, and when I washed and dried it, it left behind a yellow residue, but I used my stain remover and it came out on the second wash!